Order: Fagales Family: Juglandaceae Chromosome Number: 2n=32 1 Image used courtesy of Paul Wray, Iowa State University, Bugwood.org licensed under a Creative Commons Attribution-Noncommercial 3.0 License. 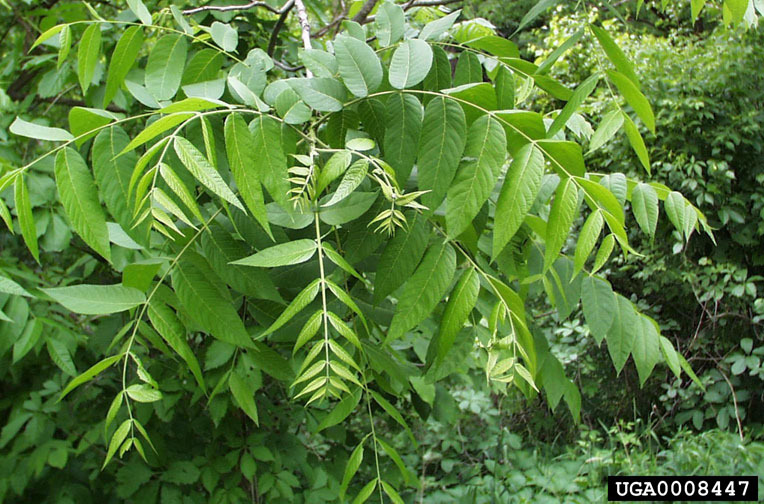 The Black walnut (Juglans nigra) transcriptome was mapped to the English walnut (Juglans regia) genome assembly using GMAP. A full sibling population was created, representing two nut cultivars in the University of Missouri (MU) germplasm repository, 'Sparrow' and "Schlessler'. The population consists of 323 seedling full sibs (all derived from the 2008 seed years), plus both parents. Full sibling status was confirmed via paternity exclusion genetic testing on all individuals. This paternity exclusion (PE) work was initiated in 2009 and primarily funded through the University of Missouri Center for Agroforestry (UMCA), in cooperation with the Romero-Severson (JRS) lab at the University of Notre Dame (ND). A second full-sib population totaling 135 to date, sharing the female parent “Sparrow” with the first population, was started at UM in 2015. The seed parent Sparrow was selected for whole genome resequencing at UC-Davis for a USDA Specialty Crops Research Initiative (SCRI) project headed by David Neale. Data is expected sometime in 2016. There are 939 SSR markers associated with 939 features in this organism.